In case you haven’t caught on yet, I’m a huge advocate of having a pantry stuffed with dried goods. Legumes, grains, you name it, I’ve got it in a mason jar ready for use. And on those occasions when I notice it isn’t stocked full, I briefly panic and then run out to replenish whatever is missing. I guess it’s almost a compulsion, since it’s not like I’m going to not have access to food– I live a few blocks from our co-op. I may be a little crazy, but I embrace it. Summer is a great time to combine those dried goods with some of the season’s freshest offerings. I love the combination of peas and pesto. 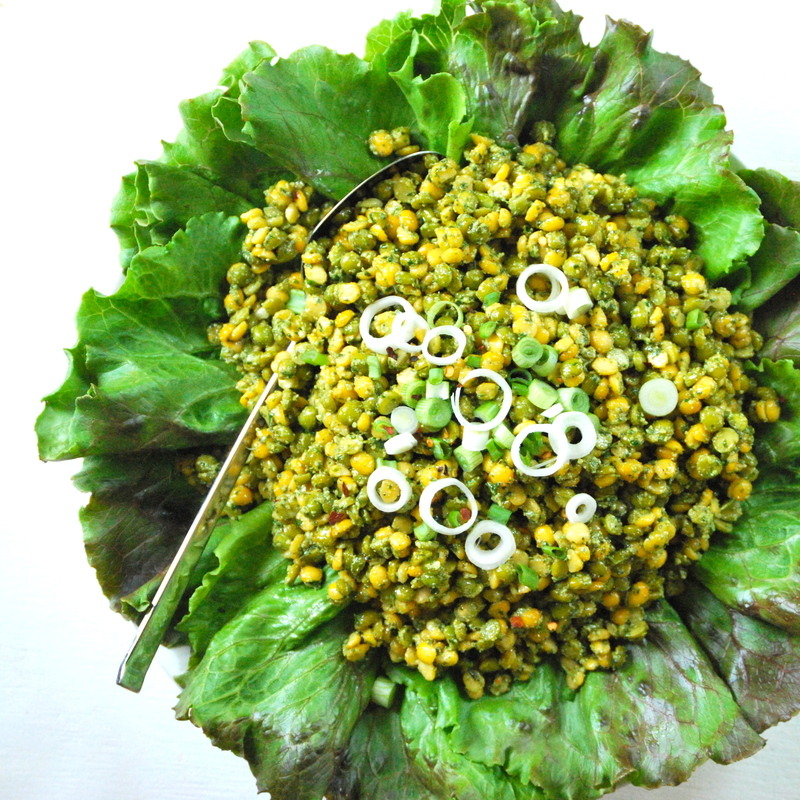 Using dried yellow and green split peas here works beautifully and is absolutely stunning to look at. 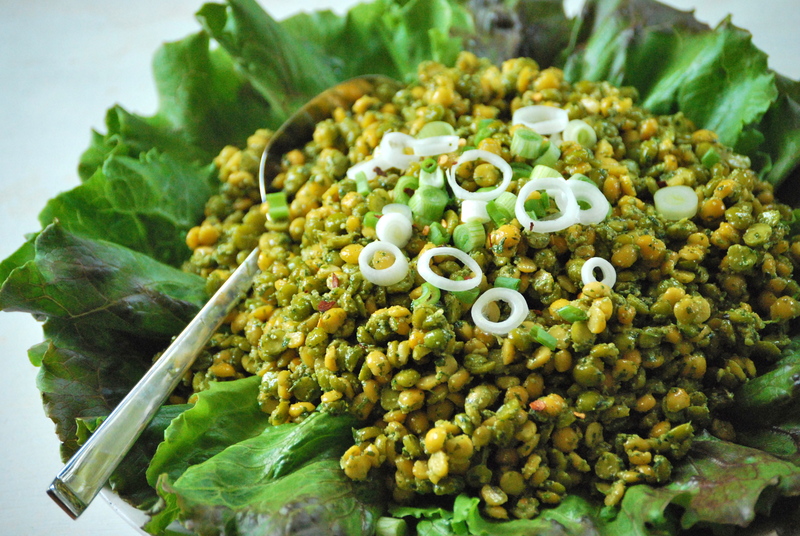 The sliced scallion on top provides a nice crunch and a burst of freshness. This salad is also very filling– it’s one of those that can be a stand-alone meal. And with a smaller portion size, it pairs wonderfully with most any grilled foods. About this time of year, I also start to make large batches of pesto to freeze for the winter. I’ll pop a small portion into ice cube trays or muffin tins to fully freeze. I then pop them out, wrap them in plastic wrap, and put them into freezer bags (or use my vacuum sealer). 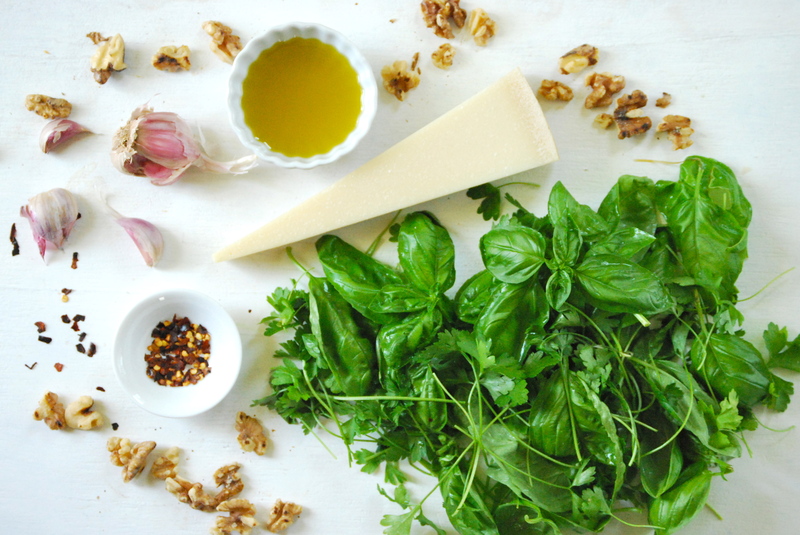 It’s a wonderful treat in the cold winter months to have pesto to mix into pasta or to dollop into soups. If you choose to do this– a word of advice. If you blanch your greens for just 30 seconds or so, then put it into an ice bath to stop the cooking process and proceed with the recipe–your pesto will remain a beautiful, vibrant green, even after it has been frozen. I always use this method if I’m planning to freeze my pesto, or even if I know I’m going to have leftovers that may sit in my refrigerator for a few days. The color just ‘pops’. One more trick regarding pesto, remember you have the option to add a bit of water instead of more olive oil to loosen it up if it’s a bit thick. Either way, be sure to season it appropriately with kosher salt– the right amount can make the pesto sing! Enjoy! To cook the Split Peas: Rinse the peas and place in a large saucepan. Cover with salted water, making sure that about two inches of water are above the peas. Bring to a boil, then reduce to a medium/low. Cook for about 25 minutes, then begin testing them for doneness. You may need to cook them longer, depending upon how high your heat was. You will want them to be soft, but retain their shape. Be careful not to overcook them, or they will turn to mush. When done, drain the water and let cool. To make the Pesto: As I stated above, you can choose to blanch the greens or not, depending upon how fast you’re going to use the pesto. You decide. Place either the blanched or unblanched basil and parsley into a small food processor (use a large one, if making a bigger batch). Pulse a few times to chop up a bit. Add the parmesan, walnuts, garlic, red pepper flakes, and a pinch of salt and pepper. Pulse a couple more times to combine. With the machine running on low, slowly begin adding the olive oil. Scrape down the sides, as necessary. Add as much olive oil to reach your desired consistency. Or, add a few tablespoons of water at the very end to loosen it up a bit. Re-season with salt and pepper. Use right away, or place in the refrigerator with plastic wrap tightly pushed onto it’s surface, or freeze. Place the lettuce leave onto a large platter. 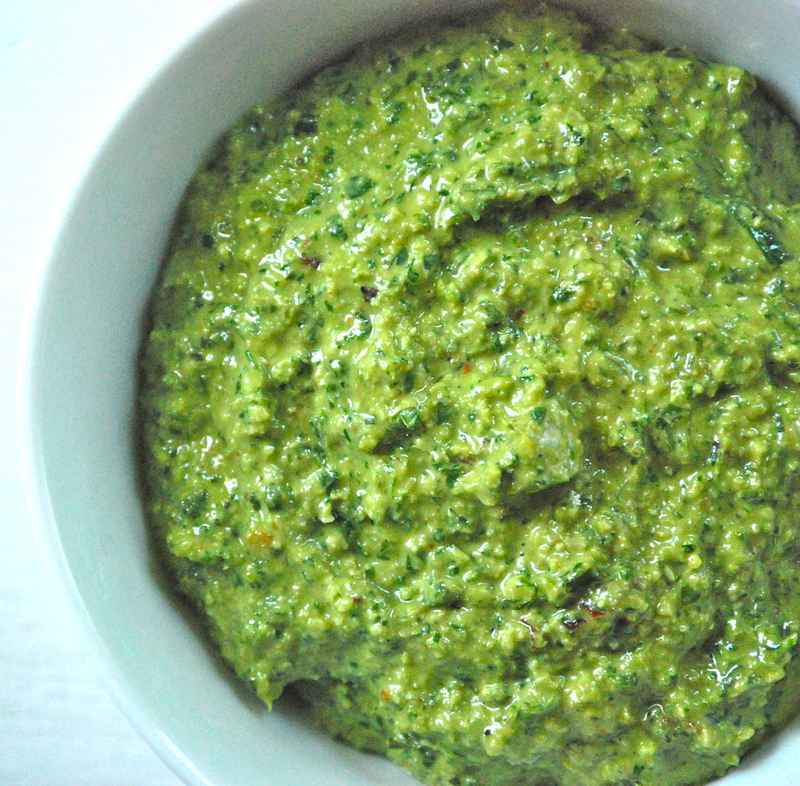 Mix the cooled split peas with about 1/3 cup of the pesto, use more if desired. Add salt and pepper, if needed. Pour mixture over the lettuce, top with sliced scallions, and a drizzle of good olive oil. Enjoy! 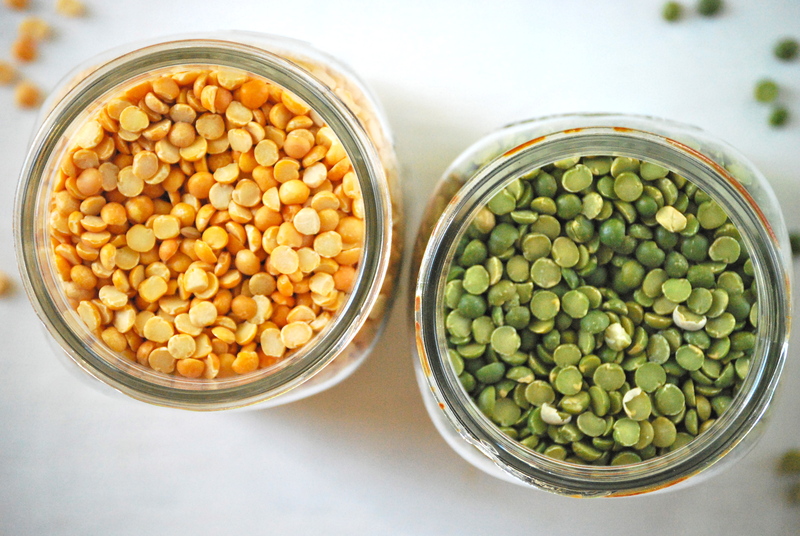 I never know what to do with split peas – thank you for this inspiration!